I’m a firm believer in simplicity. Speeding down hills on a bicycle, holding hands with the one you love or getting lost in a book are all things that are pure and good. I’m a girl who loves living in the city but also dreams of building an energy efficent home out of cob in the country. Ahh, the simple life is for me. Food is one thing that tastes best when it’s simply done. Sure, I love a knock ’em back decadent meal (when someone else is cooking), but when I’m making a meal, the simpler the better, I say. Tonight’s dinner is a perfect example of simplicity. The nice thing about pasta is that a welcoming plateful of something that can be whipped up in no time with ingredients that probably exist in your own kitchen. Note that with any egg recipe that uses undercooked eggs, fresh free range eggs (my preference is for free-range organic) should be used at all times. 1. Cook the pasta in boiling salted water until halfway done. Add the broccoli and continue cooking until pasta has cooked and the broccoli is bright green and tender. Drain. 2. Mix the egg and milk together in a small bowl and pour over the hot pasta/broccoli mixture. Add the parmesan cheese and mix well until combined. The heat from the pasta will cook the egg as it tosses. Add salt, pepper and butter, tossing to mix well. Serve immediately. Also, those fortune cookies are delightful…Did you use choco chips to melt? That sounds great. 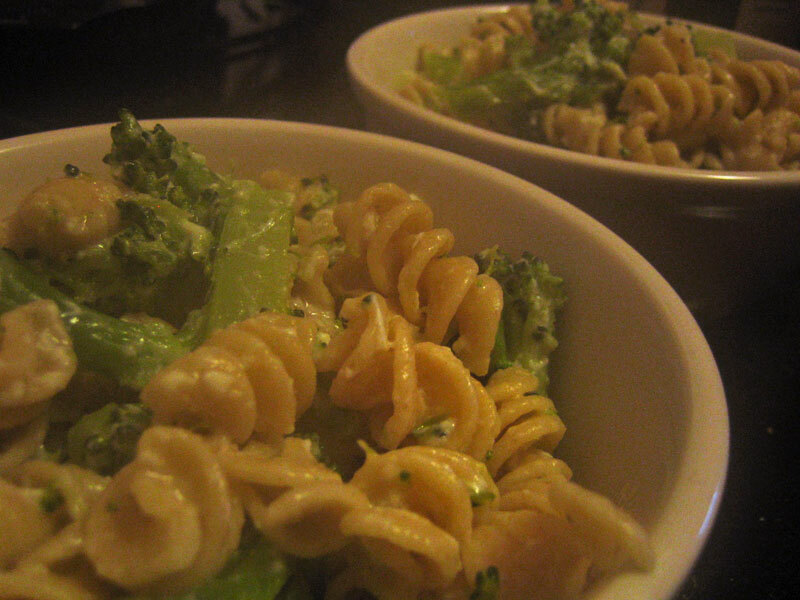 I love whole wheat pasta and I like the idea of using the broccoli in the carbonara. I will be trying this one. Thank you! mm-mmm- does that ever look good. oh by the way , on the weekend i made the salad dressing from a few posts back- DELICIOUS!!! I have to say this looks so good. Very healthy too! I agreee wholeheartedly on keeping simplicity in the kitchen. I just can’t enjoy whole wheat pasta, it tastes so dense and heavy to me. But I love the broccoli carbonara idea! Hi Purplecupcake, welcome! For the fortune cookies, I used the good stuff — Callebault chocolate and it worked like a charm! Jill, this is a definite keeper of a recipe. Cornelius went back for seconds! Joe, it really is tasty and pretty healthy to boot! I can understand your feelings on ww pasta Rorie. I don’t mind it at all and this would definitely be just as awesome using regular pasta too! I made this last night for me and my housemate. It was very simple to make yet absolutely delicious! We also added grilled sausages and mushrooms for more color.